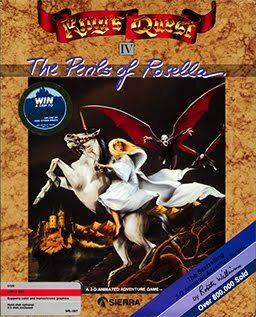 King's Quest III: To Heir is Human was the third game in the King's Quest series. A slave to the evil wizard Manannan must escape from the wizard's house without the wizard finding out what he is up to. King's Quest III is now supported by ScummVM, a program designed to let 2D adventure games run on multiple platforms. With ScummVM, King's Quest III now runs on modern versions of windows, as well as Linux, Mac OS X, and many consoles such as Dreamcast, Wii, PlayStation 2, and PlayStation Portable. For a complete list of platforms supported by ScummVM, see here. In 2006. Infamous Adventures released an unofficial fan remake of King's Quest III using the Adventure Game Studio (AGS) adventure game creation program. This remake is done in the style of Sierra's later SCI remakes, giving the game a mouse controlled interface, removing the arrow key sensitive deaths, updating the graphics (the game aims to emulate the 256 color VGA graphics of the official Sierra remakes of the 1990's, although the game features a higher color palette), as well as new music, voices and sound effects. It was made without approval of Vivendi Universal (the license holders of the Sierra franchises at the time), but it has the (unofficial) approval of Josh Mandel, the original voice actor for King Graham, who reprises his role for this fan remake. This fan remake is available for free from Infamous Adventures. In 2011, another fan remake was created by AGD Interactive, also made with Adventure Game Studio. This remake was also done in the style of Sierra's later SCI remakes, and also had all of the enhancements to the interface, graphics, music, and voice acting that the Infamous Adventures remake had. It follows the revised unofficial timeline that began in their King's Quest II remake, Romancing the Stones. It also has additional dialog and puzzles that were not in the original game. AGD Interactive was granted a fan license to create their fan games from the license holders of the Sierra franchises, Activision. Josh Mandel also reprised his role of King Graham for this fan remake, and Lori Cole, the co-creator of the Quest for Glory series, provided the voice of Smaude.